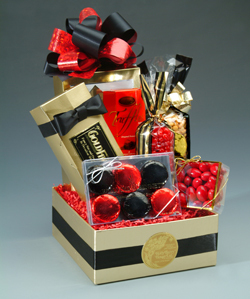 We design & create fabulous gift baskets containing candies, cookies, snack mixes, nuts, chocolates and more. 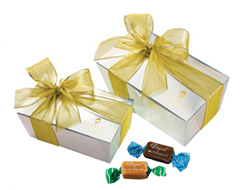 Each is custom-created to meet your requested budget, to include products that reflect the recipients and decorated with a bow hand made to coordinate with the color scheme. Baskets shown are only examples of what we can do. Award-winning flavors include Vanilla Butter Caramel, Chocolate, Espresso, Celtic Sea Salt, Salt-Chocolate, Pomegranate, Butterscotch, Green Apple and even Chipotle. You can select a combination of whichever flavors you prefer. There are approximately 58-64 large caramels in the box. Kosher Certified. 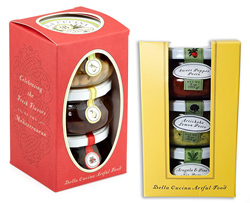 Choose from these award-winning Condiment Trio Gift Sets: The Antipasto Set includes Artichoke Parmesan Pesto Dip, Kalamata Olive Pesto Dip and a Preserved Lemon Cream. The Chef's Selection includes Sweet Roasted Pepper Pesto, Artichoke Lemon Pesto and Arugula Piune Nut Pesto. Gift includes boxed recipe cards and a music CD. Each recipe has a sensational food photo, practical cooking tips, shopping list, recipe easel, and great music for cooking & entertaining. Many titles to choose from such as Salsa, Pan-Asian, Cocktail Hour, Comfort Foods, Grilling, Chocolate Bliss, Organic Vibe and nine others. 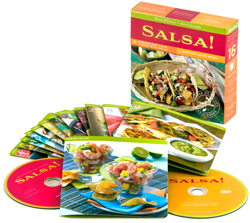 Music CD features many Grammy award winners and well-known favorite melodies.